Are you wanting to try out the polka dot trend but you’re not sure how to wear this pattern? Let me help! 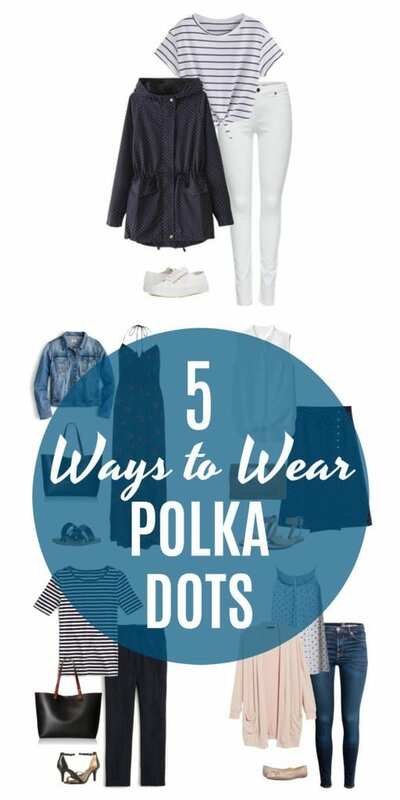 Here are five ways to wear polka dots this spring and summer. I shared a few spring fashion trends in February’s What to Wear This Month, which included patterns like polka dots, florals, and stripes. Polka dots are supposed to be a fairly big trend this year, but wearing the trend can be tricky. If you’re like me, I always think of Minnie Mouse! And while she’s one stylish mouse, I don’t really want to channel my inner Minnie with a matching polka dot bow and skirt. So how can you wear this trend stylishly? 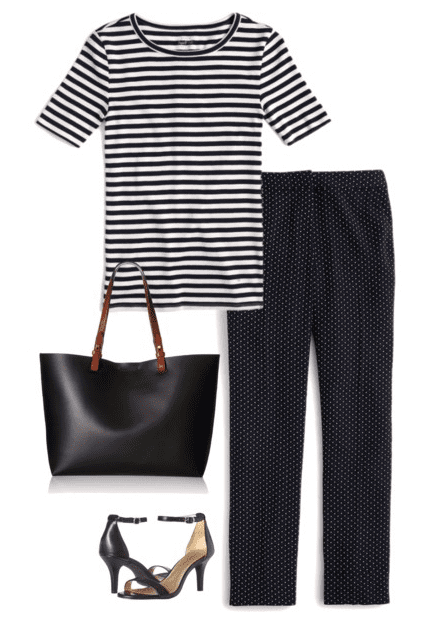 Check out these five polka dot outfit ideas for inspiration. How cute is this polka dot trench coat?! Paired with a striped shirt and white denim, you have one stylish outfit that’ll also help keep you dry in those spring rain showers. This navy blue trench will look just as great with regular denim or even a pair of colored denim like mustard or burgundy. Check out more polka dot trench coat picks below. I found so many cute polka dot tops for spring and summer (see more below) and I really like how it looks paired with a cardigan. 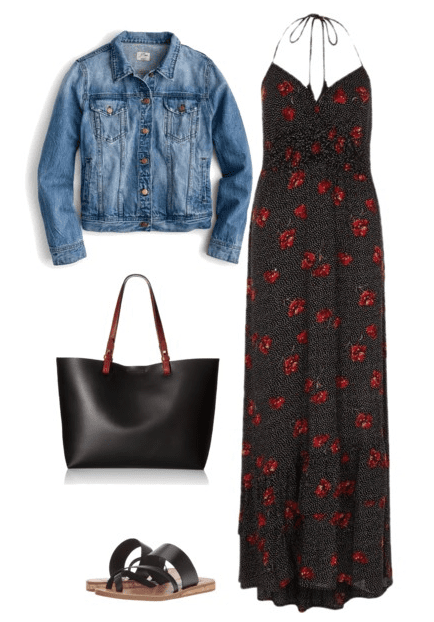 This maxi dress not only has polka dots but a floral pattern as well. This is the perfect dress to take on vacation with you. During the day, pair it with a denim jacket and sandals. At night, lose the jacket (if the weather is warm enough) and add a pair of strappy heels to dress it up a notch. See more polka dot maxi dresses below. If you love the idea of a polka dot skirt, but don’t want it to be so in your face, go for a tiny print like the skirt above. Pair it with a simple top (or a striped one for pattern mixing), sandals and a top handle straw handbag for the perfect warm weather outfit. See more polka dot skirts below. I am so in love with these pants! So much so that I also included them in March’s What to Wear This Month post. Pair these with a chambray top (like in this post) or go for a little bold pattern mixing with a striped top. The top above is a navy blue stripe, but you could also wear these with a black and white striped shirt. See more polka dot pants below. I love the maxi dress! That is something I could see myself wearing! I love outfit #4. That polka dot skirt is darling and I appreciate that the dots are understated. I’ve been loving polka dots this season! Such a fun trend. Is it bad that I liked everything with polka dots in this post? Back in college, I traded a purple corduroy shirt for a Gap Black Polka dotted top because I just loved it. Still have that shirt. These are so cute, and I LOVE that polka dot jacket.